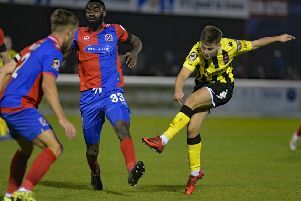 Ash Hemmings comes into AFC Fylde’s squad for the New Year's Day rematch with Barrow after ending his loan spell with Altrincham a fortnight ahead of schedule. A shortage of bodies has prompted Fylde boss Dave Challinor to recall the 27-year-old early. Fellow winger Danny Williams and Jim Kellermann both end their loan spells at Mill Farm after tomorrow's home game, while Lewis Montrose and James Hardy are injured. Challinor said: “We are short on numbers and needed to have Ash with us. The loan has done what we’d all hoped. Hemmings joined the National League North club on December 4 and has scored twice in five Altrincham appearances. Fylde drew 1-1 at Barrow on Boxing Day – the only one of last month’s five National League games that the in-form Cumbrians did not win. The Coasters ended the year in style too, taking 10 points from their final four games. Fylde full-back Luke Burke made three appearances for Barrow on loan from Wigan in February 2017 but admits their style did not really suit his game. Burke said: “Barrow can be quite direct and I couldn’t really get to grips with it, but I suppose it’s just another way of playing the game and it can be effective.